← The Morning Rant- Hats off to Amazon, W H Smiths, and Shame on you Facebook. I was on my way to the London Library when I stepped across the street to capture an Iconic symbol of England, the phone box. The phone boxes are normally red, but there are black ones hanging about. I loved this door with its lamp post guarding one side and just to the front of this door, a door to another world and the past- a landline telephone. No teleporting from this phone box please! 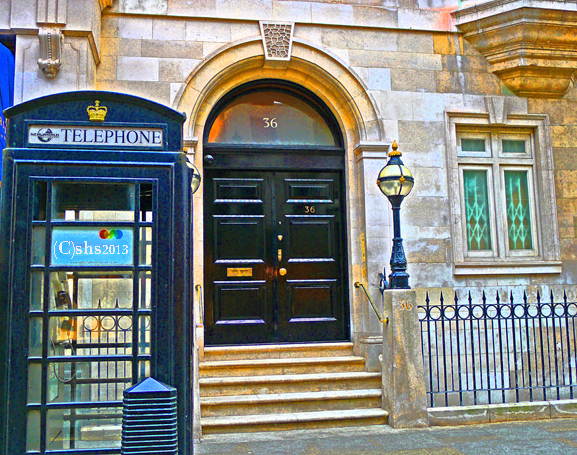 Gallery | This entry was posted in Doors and tagged England, Lampposts of London, Listed building, London Library, Red telephone box, Susan Sheldon Nolen's Doors, Tales From The City, Telephone booth. Bookmark the permalink. as I’ve never seen them before – those lovely colours are real eye-openers!